Value-added modeling for educational evaluation is currently receiving considerable attention, with a number of different value-added models (VAMs) being proposed. Two relatively recent additions to the VAM pantheon use nonparametric analyses that make fewer assumptions: the standardized gain model (SGM) and the student growth percentile model (SGPM). 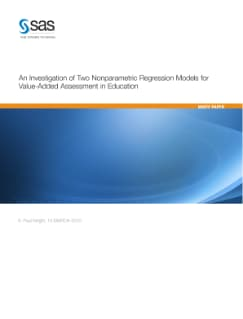 This paper, written by S. Paul Wright of SAS, investigates these two models, comparing them to some alternative models when applied to actual student test data, and discusses the results of the comparisons.